In the Netherlands, we find the floodplains that border the river Rhine. These so-called ‘uiterwaarden’ form a bufferzone against high waterlevels from the river in the central part of the Dutch country. The floodplains of the Rhine are part of the Natura 2000. Near Wageningen, they are partly used for grazing, and partly function as natural wetlands. The biodiversity in these wetlands is incredible, records show observations of more than 300 different bird species. One of the 42 recorded mammal species in these floodplains is the European beaver (Castor fiber). For almost 10 years, the beaver feels right at home here. Although the area is still actively managed by humans, the beaver seems to be ignorant towards these intruders and continues its unique lifestyle. The biggest beaver lodge people can see up close is in the middle of a young willow-forest. The beavers built it with hundreds of branches and partly covered it in mud. Here and there, along the waterline, you find fallen trees and little stumps. The beavers have not started to build a dam yet, which would drastically change the landscape of the floodplains. Recently, our team visited sites in Austria and Germany where the results of beaver dams were clearly visible. 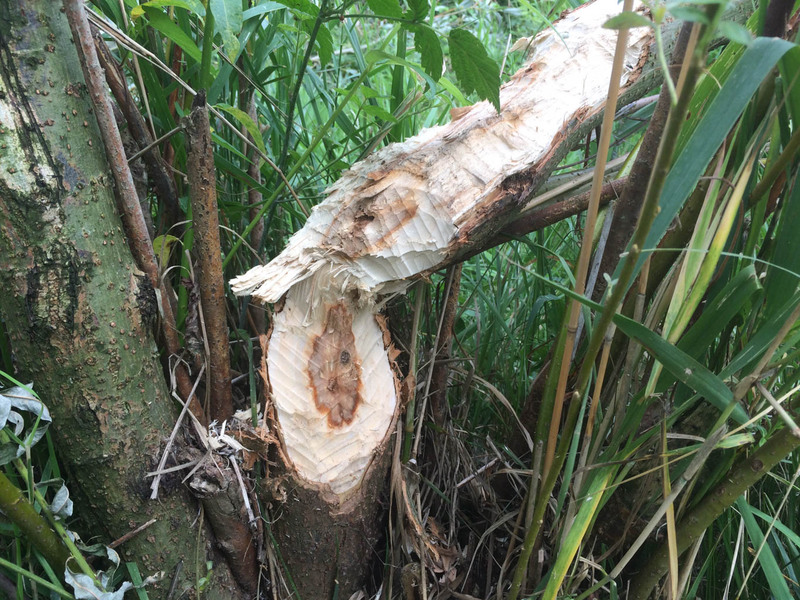 In Allentsteig, where our team recently joined an excursion into wolf-territory, the beaver created a wetland that could cause problems for the active military forces in the area. The beavers constructed a dam beside a bridge. The people feared that, when the beaver would die and the dam would collapse, the bridge would be damaged or destroyed. To minimise that risk, they placed a drain in the beaver dam, which lowered the water level. In the Königsbrücker Heide Wilderness the beaver is also changing the landscape. There are wetlands that are actively kept in place by the beaver dams. These wetlands provide home for many fish, amphibians, small rodents and plants. The wilderness also shows what happens when a beaver does not maintain the dam anymore. When wetlands dry out, large grasses and sedges soon occupy the wet soil. The trees that were standing in the wetland have completely died off, but are still standing. This creates surreal landscapes where nature starts to develop new wilderness again, until a beaver returns to the same spot to create a new wetland. Is Wilderness a threat to the traditional nature conservation concept? Another golden jackal in south-eastern Austria?